Do you have a “gummy” smile? If you do, what you see when you look in the mirror is a lot of gum tissue and not much of your teeth. Excess gums can make you feel self-conscious and force you to hide your smile. Fortunately, there are two dental procedures that can improve the appearance of your gummy smile. During a laser gum lift in Newport Beach, Dr. Yazdan isn’t actually lifting your gums. Since there’s an excess amount of tissue, removing some of them gives the appearance of a gum lift. The results reveal more of your tooth surface that’s been hiding underneath the gum tissue. Lasers have been used in dentistry for many years and are extremely safe for multiple procedures. They’re also used to collect tissue samples to be biopsied, whiten teeth, perform gum disease surgeries, and in some cases even remove decay. 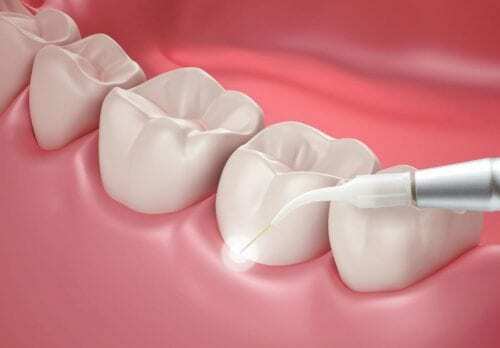 A dental laser is a handheld device with a tip that’s extremely small, like that of a ballpoint pen. The precise tip helps to remove exactly which gum tissues we need to, without damaging the areas around it. Its accuracy provides us with more control over the results. With laser treatment, bleeding is minimal and there’s no risk of infection. You’ll heal faster, too! This device is great for treating uneven gum lines. By recontouring the excess gums, we can provide you with a more symmetrical smile. A laser gum lift is a minimally invasive and virtually painless procedure. It usually takes less than an hour to complete. Recovery time is instant and more comfortable than other gum lift methods. You’ll see immediate results in the mirror as soon as we’ve completed your treatment. 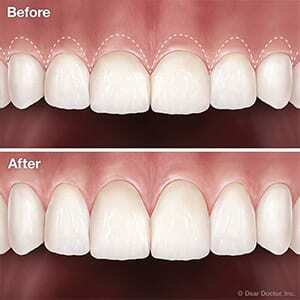 Crown lengthening is another type of gum lift procedure that we offer. The portion of your tooth that extends above the gums is called the crown. This procedure removes excess gums and bone tissue to reveal more of the tooth’s crown. A lot of times when this procedure is completed, it’s performed in conjunction with a restorative crown, which is a hollow shell made from a strong material like porcelain or gold. It’s used to cover a tooth and protect it. Perhaps the natural tooth is very weak because it’s broken or badly decayed. In this case, our Newport Beach dentist may recommend crown lengthening. This measure will reveal more healthy, solid tooth structure, providing a stronger base for your restorative crown and giving it the potential to last longer. Since bone is also removed, the crown lengthening procedure takes longer to complete vs. laser gum lift treatment. The healing time will also be longer. To soothe your gums and help them heal faster, gently rinse your mouth several times a day. A mixture of warm salt water works best. In some cases, we’ll give you a special mouthwash to use. Brushing your teeth and gums is also very important. Use an extra-soft bristled toothbrush at least twice per day. Gently massaging the gums with your toothbrush will stimulate them to heal faster, but don’t scrub too hard since this can cause damage to the tissue. For the first few days after your procedure, you may experience some bleeding. This is normal, so don’t let it discourage you. Just let us know if it doesn’t stop. At first, your teeth may be temperature sensitive, especially to cold. Your gums may be too tender to eat hard foods, so it may be best to start with soft foods only. Within a week or so following your procedure, you should be able to eat and drink normally. One of the great things about gum lift surgery is that you’ll be able to see a big difference right away. After a few weeks of healing, the final results will be obvious. Recovery from laser gum treatments is even quicker, if not immediate. You may be surprised to see what an improvement on your smile gum lift surgery can make. If you feel self-conscious about your gummy smile, call the Center For Restorative & Cosmetic Dentistry for a consultation. Dr. Yazdan will determine which gum lift procedure is right for you. Don’t hide your smile any longer. 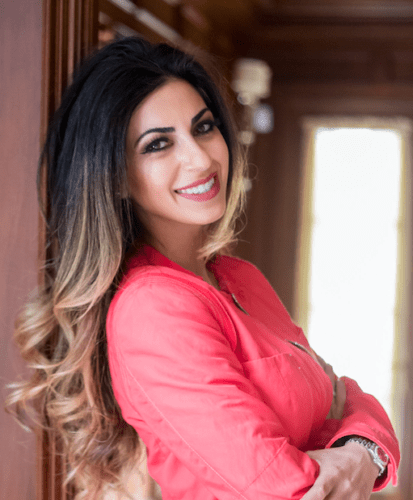 Restore your confidence with a gum lift in Newport Beach. Give us a call today!